This wonderful, student-centred fluency activity generates lots language in the classroom with a good mix of scripted and spontaneous talk. If you’re weary of the traditional oral presentation format – one student speaks for five minutes and 19 others feign attention – yet want to give students a chance to write and speak, this is a must-try activity. Resources: each student prepares a poster; teacher brings adhesive tape. Some advanced preparation is required. I generally give students two weeks notice so they have time to do some research and prepare a poster. Each student chooses a topic that he/she is interested in and knows well. It can be anything. Try topics that are fun, interesting and informative; they should be something that students can teach others. Do some research, write notes. Create a 2-4 minute talk. Make a poster. Organize the ideas. It is useful to remind students that the poster does not have to be beautiful or complex. A couple of pictures or graphics and some text on four pieces of A4 paper taped together is usually sufficient. In the past, one student made a delightful poster with crayons. The purpose of the poster is the help the speaker by providing prompts for his/her speech. Lists of things and how to posters are simple but effective themes. 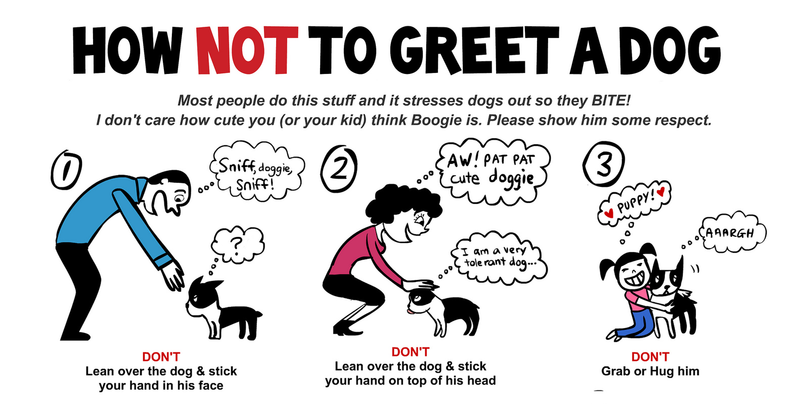 Examples of posters: How not to greet a dog; how not to kick in a door; how to use hypnosis. I try to dissuade students from how to cook some special food because there are few opportunities for meaningful follow up. Divide the class into two equal groups, A and B. Group A students move to the outside of the classroom and tape their posters to the walls and whiteboard. Make sure the students are spaced out because the room can get a little noisy. Group A students stay with their posters. Group B students mingle with Group A students, one on one. Group A students give their short speech. Group B students listen and ask questions (I often mandate a minimum of two questions just to get the conversation started). Teacher mingles and monitors discussions, provides encouragement for lower level students. The first round takes about 40 minutes. Expect an average of four to six minutes per mingling student. Once the conversation dies out, call for a break. Group A students remove their posters. Group B students put up their posters. Repeat the mingling and presentation process. After the clean up, finish with a pair work discussion. Ask students to summarize two or three interesting presentations. 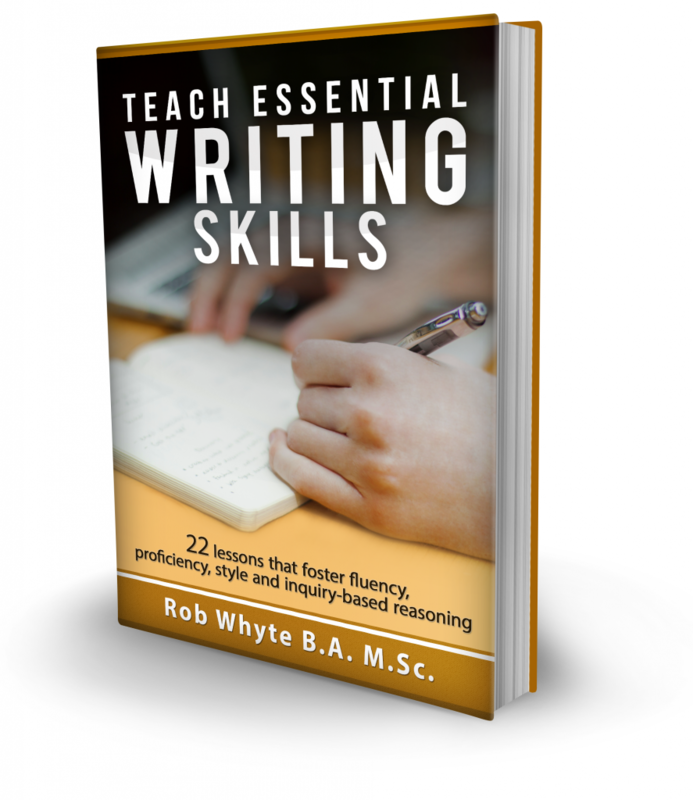 Get the ebook Teach Essential Writing Skills. 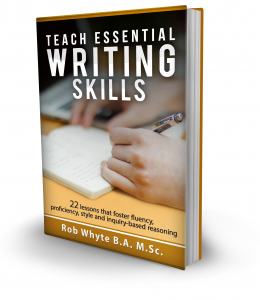 Transform the quality of EFL student writing by focusing on four essential skills. 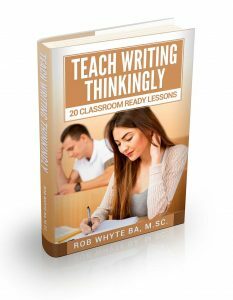 Click here for details about the ebook that should be part of every writing teacher’s resource library. 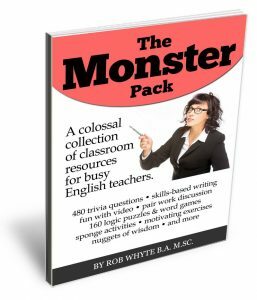 Cut your lesson prep time with this colossal collection of ESL resources that stimulate language learning and critical thinking. Simplify your lesson planning because teaching should be a joy, not a chore. The image in this post comes from lili chin and its use complies with the owner’s creative commons licensing terms. Great idea; thanks for sharing it. I’m wondering if you do any kind of assessment for this, and/or have a method by which students can give each other feedback.